Used Steel Shelving | ACE Industrial Equipment, Inc. There are man y different manufacturers of steel shelving across the US. 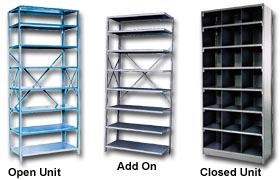 Used steel shelving is very popular because it provides the strength of heavy duty shelving at a reduced cost. Ace stocks many styles of used steel shelving. For more infomation on the different types of new and used shelving call us today. We serve businesses in cities all across the nation, including Dallas, Seattle, Chicago, New York, Hollywood, Atlanta, Charlotte, and Tampa.